Not only did it require 10 poles per coil, the pickups had to be slanted (and slanted in opposite directions -- it's a fan-fret guitar! ), but the spacing between the strings was not the same all the way across; it's gradually wider as you go from high strings to low. As with nearly all guitars, the spacing gets narrower as you get farther from the bridge, so no, the photo is not distorted! (Or at least not that much.) The customer was adamant that all the poles line up dead center so the spacing not on just each pickup BUT ON EACH COIL had to be custom -- four coils with identical spacing just would not do. Yes, lots and lots of precise measurements had to be made. I also had to cut the Alnico 8 magnets to work with the slant. 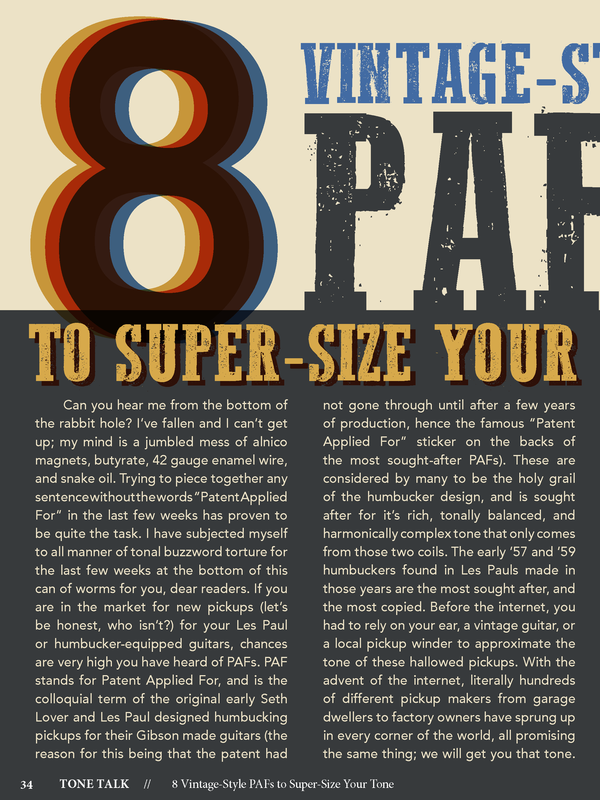 ​TO GET ALL THIS RIGHT, I had to have the guitar shipped to me so I could make precise measurements. Also, if you look closely at the 2nd photo (below) which is pre-Zhangbucker, you'll see that the spacing on the polepieces is just awful. ​You can also see the poles line up with the strings now. The neck pu appears to be slightly skewed to the bass side but I made the mount screw holes a little wider so there's some play for adjustment -- a little nudge toward the treble side would have all 20 screws lined up dead on as they are in the bridge pickup. THE BOBBIN MATERIAL IS FORBON, the same stuff used on traditional Strat/Tele bobbins (as opposed to the 1-piece plastic bobbins). 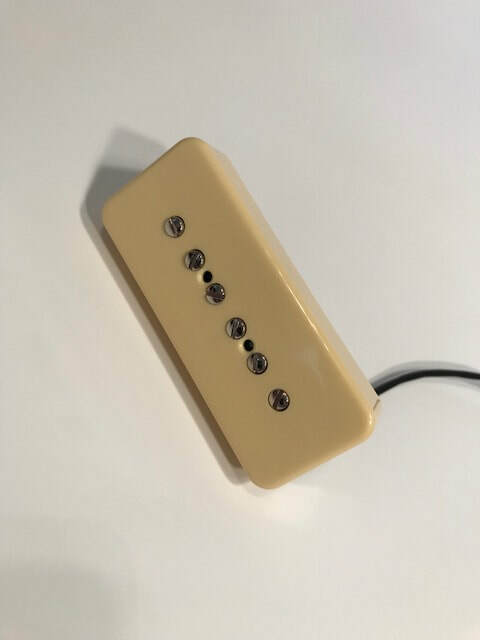 Have not yet tried plastic material to duplicate the traditional look of humbuckers but am looking into some material that doesn't warp when dropped in the wax pot. 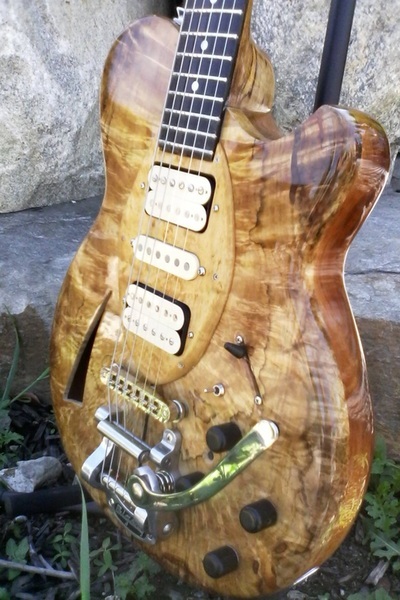 If you have a guitar with geometrically unusual pickups, give me an email at zhangbucker@yahoo.com or call (816) 284-9859. Depending on what you need, you may have to ship me the guitar as was the case with this job, but that will guarantee the best results. NEW P90'S FROM ZHANGBUCKER R&D LABS! 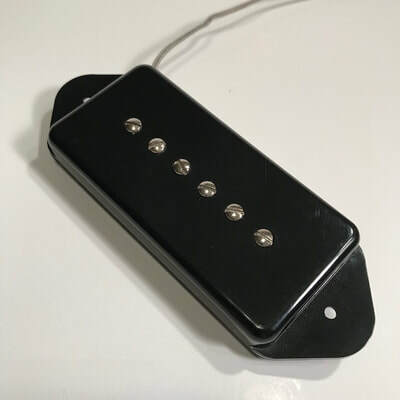 ​A brand new model from our R&D labs, the Zhangbucker Lollipop is a low-wind (6.0k with 42 PE) neck P90 soapbar originally intended for Telecasters to match better with Tele bridge pickups but on testing could be used in the neck in almost any guitar/context. 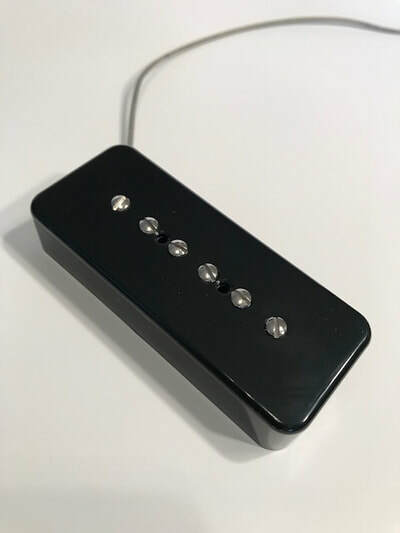 My neck P90's always have narrower magnets (3/8" vs. standard 1/2") to trim the fat but there is usually a mix of an Alnico 5 on the neck side and an A2 (or A3) on the bridge side but to somewhat counter the loss of warmth from the lower wind, both are Alnico 5. 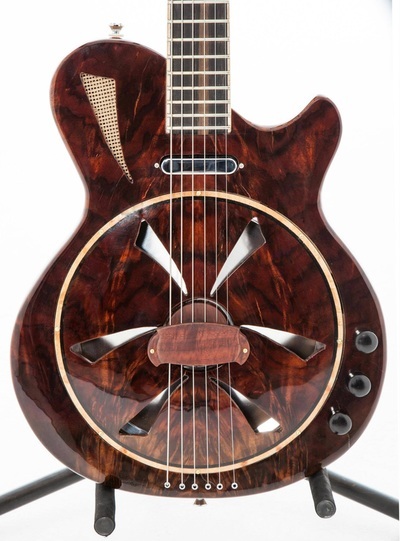 This gives it a paradoxical combination of roundness without darkness, warmth without ANY loss of detail -- a tone big and round and sweet like a lollipop but with tons of woody/flutey, hollow, vintage jangle, snap, air, detail and dynamics -- with a little extra push than the standard A5/A2 combo. SPECIAL TEMPORARY NOTE: The prototype is available for $80 shipped -- See SPECIALS Page! Brand new from Zhangbucker R&D labs, the Snark 90 is wound to 8.8k with Alnico 4 magnets but -- most importantly -- with double-build formvar magnet wire instead of the usual plain enamel. It was an experiment resulting from just asking, what would a Cherrick bridge sound like if wound with formvar? Well, the formvar gives it a lot of snark and honk and extra rudeness. But to keep it from crossing over from rude to grating, the A5 bar was replaced with an A4, while the A2 was also replaced with an A4 to keep it from getting at all squishy. Pairs very nicely with a good neck P90 to give you some righteous Pagey chirp in the middle position. Wound to 7.8k with 42 PE and two A3 bar magnets, this one is for the LP Special or similar type guitar that's plenty loud and rude naturally and would be complimented by a sweeter mellower wind/magnet combo. 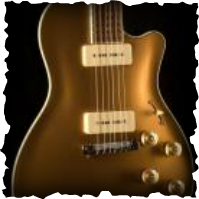 It would also be great in a semihollow or archtop (but not the neck, neck dogears are very different, require much shallower pickup and thus a pain). It's also unpotted for you no-potting fiends. Braid lead, South polarity. SPECIAL TEMPORARY NOTE: The prototype is available for $85 shipped -- See SPECIALS Page! The first prototype of the bigger Firebird (larger mags and bobbins) is complete, weighing in at 10.5k/A5 with 42 PE with a full-size no-hole nickel cover. How does it sound? Just like the name suggests, a big Firebird. For those familiar with the Paul Bunyan Tele pickup, you know it keeps all the vintage twang but adds a big midrange to widen the tone. A very similar transformation has happened here -- the classic Firebird top end remains all but untouched (I thought it would be a bit more affected) but the mids and bottom spread the tone out wide and give it a downright panoramic tone. As with most pickups I make, there's a lot of room for variation on wind and magnets so don't feel like you're stuck with the 10.5k/A5 spec. This prototype is just the tip of the spear. This baby also needs a neck mate so off the top of my head, I'm thinking 8.0k/A5, but we'll see -- and again there's tons of room for variation here too. Zhangbucker was featured in Tone Report Magazine! To read the original article, click the link below and go to page 37. David Plummer of Zhangbucker Pickups says he got into winding because most humbuckers he tried were either too muddy or too bright. His mission is to provide a no-nonsense solution to the PAF, with a balnced and 3D sounding pickup. 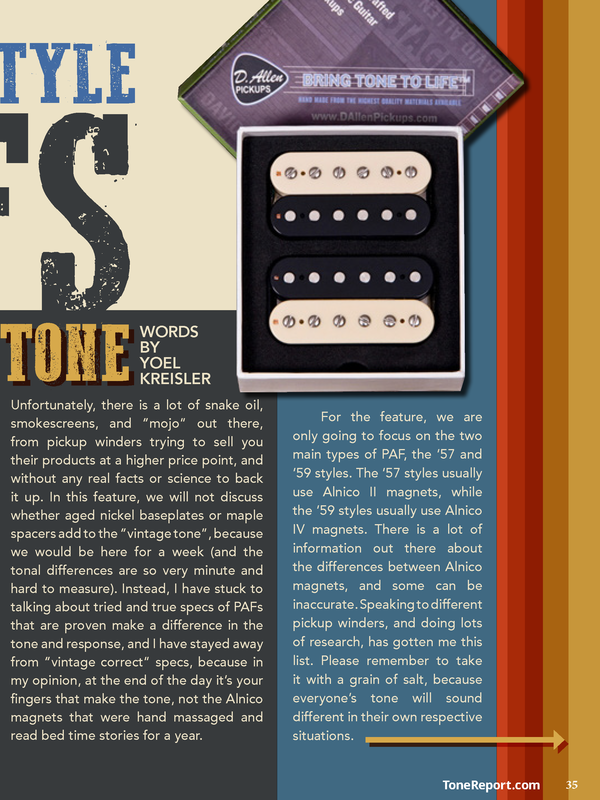 He offers Alnico II magnets as standard, but he can put in Alnico IV's as well. The tone from these are almost tube hi-fi, and offer detail and clarity for cleans, as well as a whole new dimension of harmonic complexity for dirt. Inspired by: Pickups being too muddy or too bright. Seemingly '57 inspired. ON THE LEFT: Thompson's Creek guitar by Maudal Musical Machines - semi hollow with a silver maple top with a redwood body, maple neck. X-bridge piezo pups in the bridge, a pair of Zhangbucker humbuckers and a Zhangbucker strat single coil in the middle. 5-position switch, stereo/mono output. ON THE RIGHT: Woodface (TM) electrico resonator. Black walnut and maple. Zhangbucker Bell Tone Tele* neck pu (7.0k/A5) and a proprietary mic on the cone. Designed as an 'electric' resonator, it utilizes a top of the line Beard 9 1/2" biscuit cone. Based on a Tele* neck pup with a proprietary mic. Purely passive so the magnetic pup interacts with your amp the way the gods intended. (Sounds fantastic through a PA as well so I recommend an A/B box.) Volume, voiced tone control, low end roll off. If you want to blaze away or drive your amp ridiculously hard there's a mic cutout switch in case of feedback. Check out Maudal Musical Machines here! 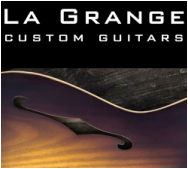 ﻿Zhangbucker is the First Choice Winder for La Grange Guitars! Both are loaded with Paul Bunyan flange-less bridge and neck Strat pickups, the Sonic Blues 2 with a "stealth" Tele-neck (wound with 43 gauge to 8k on a Strat bobbin with Strat cover) in the middle and the blonde with a straight ahead covered 8k/43 Tele neck in the middle. Check out this video of CP Thornton's Legend Special (photo left) with my P90's in it -- Blues 90 bridge with Cherrick neck! So (other than the mispronunciation of Zhangbucker) whaddaya think? Are CP Thornton and Zhangbucker a sonic match made in heaven or what? Professional wiring upgrades for Fender & Gibson guitars.